6 times life-size and dissectible into eight parts, this unbreakable vinyl eyeball sits in its bony socket to provide a better understanding of its relationship with major blood vessels, muscles and nerves. 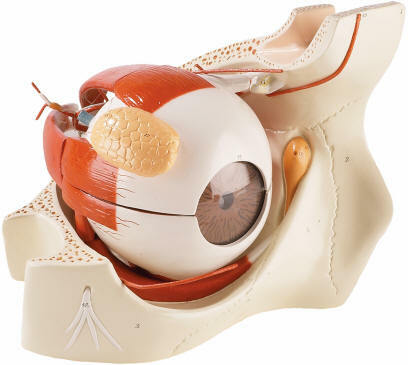 All six muscles of movement can be seen and the upper half of the eyeball with the lacrimal (tear) gland lifts off. Present and extractable are the superior and lateral rectus muscles; the iris and cornea, which can be removed as a unit; the Lucite lens, which actually magnifies and inverts images; and the transparent vitreous body, which exposes the fovea centralis on the retina. The choroid coat, retina, and optic disk can also be seen, as well as schematic cross section through retinal layers. 77 hand-numbered features are identified in the accompanying key. Also included is a reproducible black line master copy with numbered parts that correspond to the model, making it easy to print illustrated study sheets. Answer key is on reverse. Overall dimensions 12 x 10 x 9 inches. NOTE: This is a hand made model, which is made to order. Allow 4 weeks for delivery. 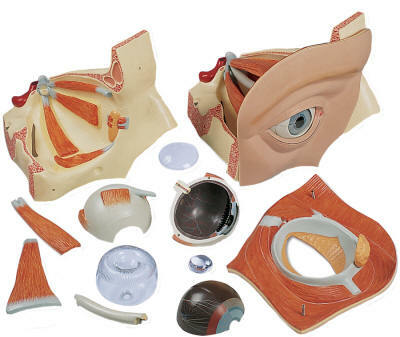 This anatomical model of the eye shows the eyeball with optic nerve in its natural position in the bony orbit (floor and median wall). 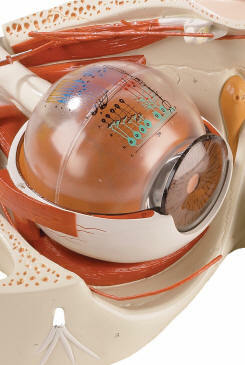 It also shows the relationship between eye, bones, muscles and other structures of the eye. Dissectible into: two halves of the sclera, optic nerve, M. rectus superior, M. rectus lateralis, cornea half, lens, lachrymal system, vitreous humour, tear gland and associated structures.